This isn't a movie review site. But the fact is, I love movies. Now that I'm plugged into Netflix, I watch about 200 movies a year. Does that seem like a lot? It's just what I do most evenings after all the heavy-duty writing and thinking I do during a normal workday. I love fiction. I love stories. I love movies. When people ask me, "What's your favorite movie of all time?" I usually say something like, "Gosh there are so many, maybe about 25 movies are at the top of my list." 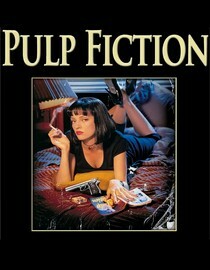 But if you held a gun to my head and told me I had to single out one, I'd have to say Pulp Fiction (1994). I've watched that movie about 10 times, and each time the pleasure I get is fresh and captivating. I love the innovative structure. I love the mix of gritty realism and humor. I love the dialogue. Some of those scenes are unprecedented in film-making, such as the moment when the young Butch is visited by the Air Force major who presents his dead father's watch to him. Or that time when Jules explains to the restaurant robber "Pumpkin" why he's not going to kill him. I'm looking forward to my 11th viewing. It stars Bruce Willis, Rosanna Arquette, Christopher Walken, Uma Thurman, Harvey Keitel, John Travolta, Tim Roth, Eric Stoltz, Ving Rhames, and my man Samuel L. Jackson. Yes, all these wonderful actors starred in this movie. Its structure is so brilliant that I've often wondered if Quentin Tarantino knew what he was doing or if it happened by lucky accident. After watching all of his movies since, none of which are as good but many of which I've enjoyed, I still don't know the answer to this question. But I digress. The reason I'm posting my second movie blog post in a row is because I've seen two movies recently that reminded me of Pulp Fiction. 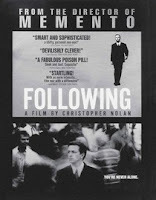 The first, Following (1998), is like my favorite movie because of its unusual, gritty story and its out-of-time-sequence structure. The movie isn't well known because the writer and director, Christopher Nolan, achieved acclaim for his later works, Memento (2000), Insomnia (2002), Batman Begins (2005), The Dark Knight (2008) and this year Inception (2010). This dark, off-beat psychological thriller is about an eccentric young British fellow who is fascinated with following people. Seemingly by chance, he meets a smooth-talking burglar who helps him take his obsession to another level. But his cohort isn't who he seems, and the consequences are surprising. The thing I love about this movie is that you never know what's going to happen next. And at the end, you realize you need to watch it again. Just like Pulp Fiction. 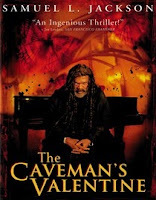 The second movie is The Caveman's Valentine (2001), starring Samuel L. Jackson. I have to say I've loved every one of his films. He never disappoints, and in this difficult role his finest talents are on display. 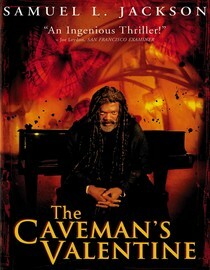 He plays a homeless schizophrenic named Romulus, who was once a talented Julliard-educated pianist. He lives in a makeshift structure in Central Park that he calls his "cave," and he believes that he's being bombarded by sinister rays from the Chrysler Building. One day he discovers a dead body in a tree next to his shelter, and he becomes obsessed with finding his killer. This is a who-done-it like no other, full of surprises. Until recently, I'd never heard of these movies, but leave it to Netflix to know that I'd like them! I loved them, but then my tastes have sometimes been described as unusual. Very likely you haven't seen them either. Do you feel lucky today? Try one. What do you have to lose? Please how can I have some of those movies to watch? I watched these movies using the Netflix service.